Kaichou wa Maid-Sama! creator Hiro Fujiwara has a new manga series called Yuki wa Jigoku ni Ochiru no Ka. With Kaichou wa Maid-Sama! finished, the mangaka has a new series underway with its first chapter set to be published in Hakusensha's LaLa magazine on Feb. 24. The title of Hiro Fujiwara's new manga is Yuki wa Jigoku ni Ochiru no Ka (English title is Will Yuki Fall Into Hell?, according to Anime News Network). 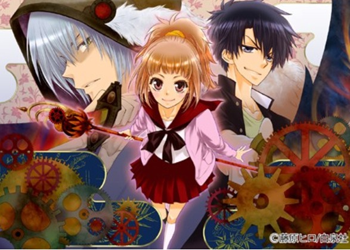 The manga is a military history story about a group of boys and girls. The main character, Yuki, lives in a rural area of Kyoto with her six childhood friends who share a secret together. Yuki's fate changes on her 16th birthday. The first chapter will be 55 pages long, and one page will be in color. Maid-Sama! was serialized in LaLa magazine and finished at 18 volumes, launching the manga in 2006. The manga inspired an anime adaptation of 26 episodes long, which Sentai Filmworks released on DVD in North America. Tokyo Pop released the first eight manga volumes in English before the company shut down its North America division in 2011. The story follows Misaki, the first female student council president of a recently made co-ed school. Misaki gains a reputation from the male student body as a "boy-hating demon dictator" as she works to make the female students feel safer. She has a secret part-time job at a maid cafÃ©, but a popular boy at their high school discovers her secret.